Every morning, the smell of coffee fills Tess Cimino’s apartment, marking the beginning of her daily routine. She then removes the coffee grounds from the machine and puts them into her compost bucket: a small container in her freezer full of organic food scraps such as banana peels, egg shells, and apple cores. Cimino ‘19 first began composting while participating in the Marist in Manhattan program in the spring of her junior year. She kept a compost bucket in her freezer, then brought it to a local farmer’s market each Sunday. “My mom thought I was crazy keeping my trash in my freezer,” chuckled Cimino. Over the summer, both Cimino and Aaron Tod ‘19 visited other college campuses that had composting stations, which inspired them to bring the practice to Marist College. Since returning to campus for their senior year, Cimino and Tod have begun creating a composting pilot program. The pilot will first focus on the Foy Townhouses, where students will be given a few three-gallon buckets to collect food scraps suitable for composting. Once the buckets are full, students will bring them to the dumpster with their normal trash, and the grounds department will collect it. When the compost becomes soil, it will be used on campus. 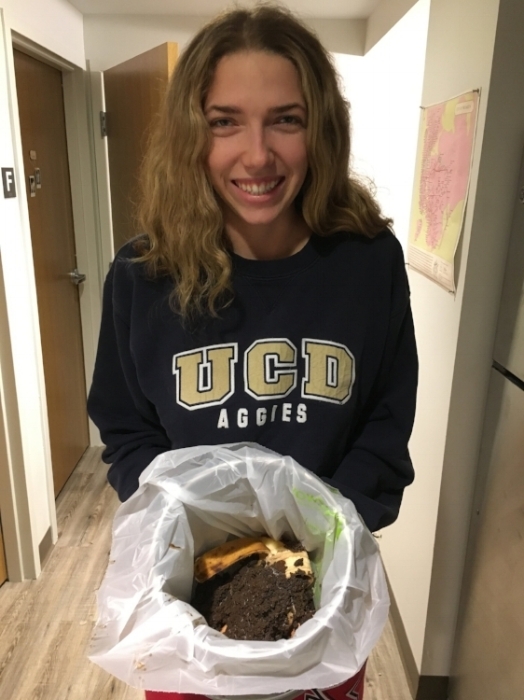 While some students may already compost at home, the method of composting that Cimino and Tod are proposing is different, according to Richard Feldman, an associate professor of environmental science. “It starts with a feeder material that stimulates the growth of yeast and fungi, and it’s anaerobic, meaning it doesn’t use oxygen,” Feldman explained. Students will be given this agent, called Bokashi, to combine with their food scraps. Bokashi ferments the food scraps and reduces methane, the gas that’s responsible for foul odors, making it suitable for indoor composting. The choice to give students bokashi was a purposeful one. A compost with Bokashi “[w]ill take meat, dairy, and even bones, which is a benefit because it further simplifies the process for students,” said Feldman. The next step for Cimino and Tod is educating and gaining support from students. To do this, Cimino and Tod plan to host workshops to teach students how to compost. “At this point it’s mostly about getting students to be aware of the waste they’re creating,” commented Cimino. The biggest challenge the two face is ensuring their composting program continues after they graduate in May. Steve Sansola, associate dean of Student Affairs, revealed that a few students began a composting pilot program three years ago with the Upper Fulton residences; however, it didn’t last due to a lack of interest. “We have everything in place, we just need enough student interest and commitment,” said Sansola. If students who don’t live in Foy want to participate in the pilot, Cimino recommended they collect food scraps in their freezers and then dispose of them in the receptacles that will be located next to the dumpsters in the Foy parking lot.